Mumbai had a grand Republic Day this year (2014) showcasing different wings of the armed forces, various departments of the state government and the cultural backgrounds of the various communities that have made Maharashtra and specifically, Mumbai it's home. The grand finale was a drive past of beautiful vintage cars, some carrying famous Bollywood stars! 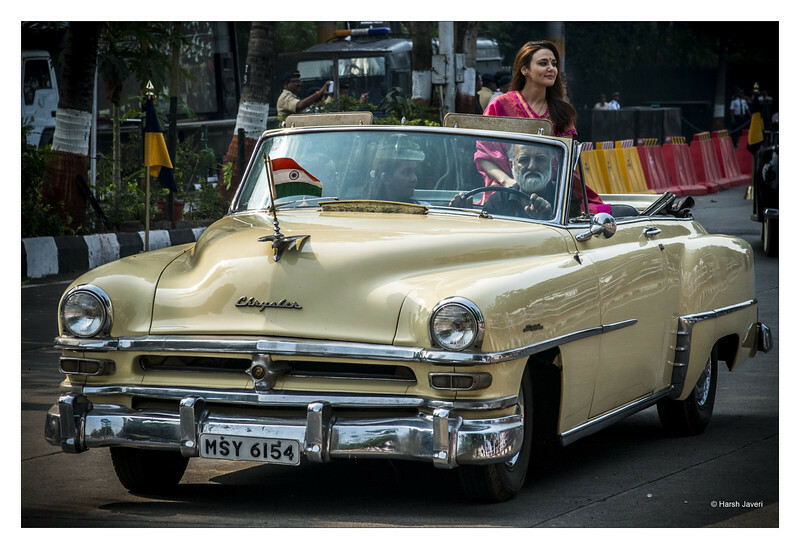 The last item in the parade was a big surprise with Bollywood stars in vintage cars! Bollywood is the Hindi-language film industry based in Mumbai (Bombay), Maharashtra, India and is one of the largest centres of film production in the world. Thank you for your comments and voting this pic at #1 along with the pic of Mallard by Elizabeth Jacobs (arctangent). Beautiful shot of this superb old car. Love old cars! Nice shot. The perfect car for this parade. Nice shot Harsh. What a wonderful car, and great shot! Great shot! Love seeing the old Chrysler!